CORRECTION: I forgot to include the 3/4 cup brown sugar in the recipe I posted below! (Thanks Amy!) I’m so sorry about that! I hope I didn’t mess up anyone’s baking adventures. We spent a lot of time this weekend working on many Fall duties, especially yard work. We are usually so enthusiastic in Spring to get out into the yard and plant new things and tend to the gardens. But now it’s just tiring and not as much fun anymore! We had to stop at the garden center to pick up some bulbs and fertilizer for the lawn. They had the coolest pumpkin displays set up next to their entry way. 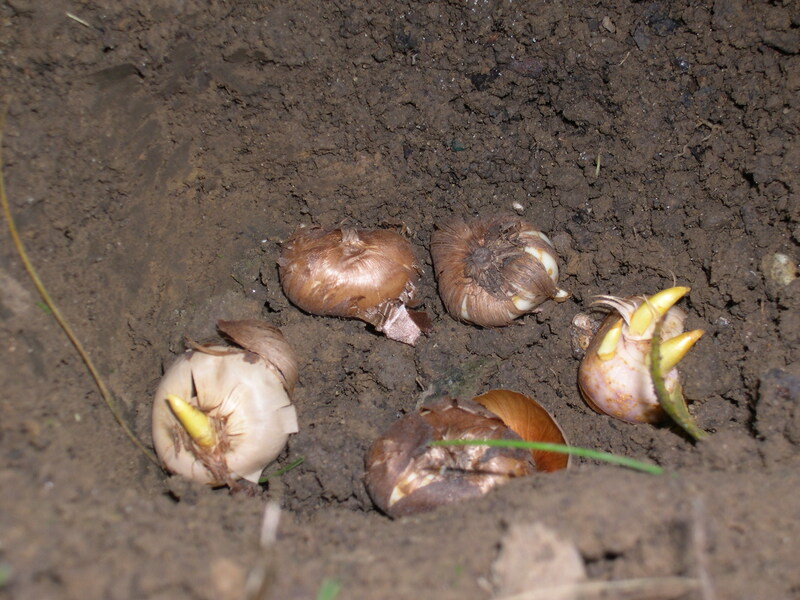 I bought a few more tulip and crocus bulbs to plant around our new trees. Then we spent a lot of time raking, mowing, and cutting down the dead foliage. Because of all that yard work, we didn’t have the energy or time to go on our usual Sunday hike. 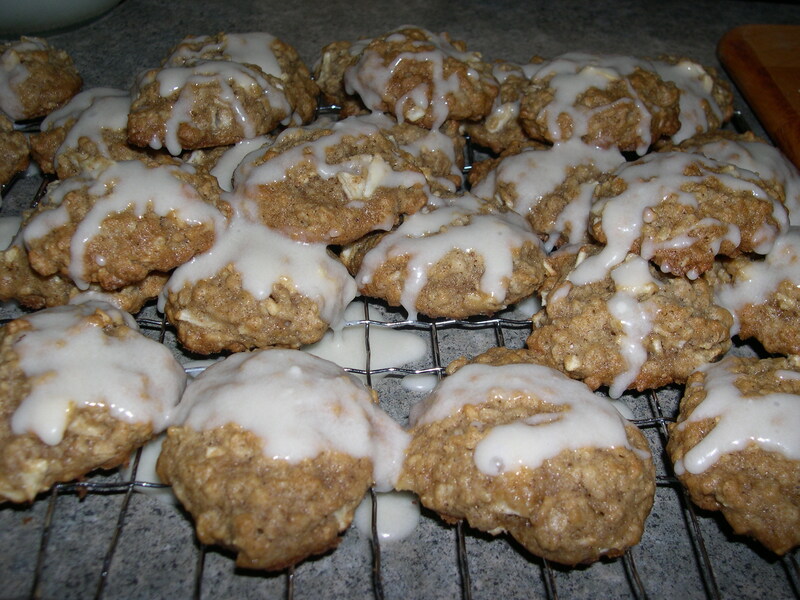 I didn’t do a lot of sewing either, but I had time to make a batch of Apple Spice Cookies, which taste even better than plain old oatmeal cookies. My husband doesn’t like fruit so I didn’t tell him they have chopped up apples in them. He didn’t notice and he loves them. Ha! Beat butter, shortening and sugars in large bowl with electric mixer on medium speed until thoroughly mixed. Beat in eggs and vanilla until well blended. Beat in oats, cinnamon, nutmeg, baking soda and flour, scraping side and bottom of bowl until blended. Stir in apples. Drop dough by rounded tablespoon-fulls about 2-inches apart onto ungreased cookie sheet. Bake 13 minutes or until edges are golden brown and centers are set. Cool 2 minutes on pan. Drizzle with vanilla glaze… and enjoy! Hope you all enjoyed a nice weekend too! I’m off to get some rest before Monday gets here. Wow, these look and sound very scrumptious. I’ll have to make these very soon and tell you how we like them. What kind of apples did you use — a baking variety like granny smith or just any old thing? I’m not much of a baker, but I may have to try these. The gang here seems to like cookies better than any other baked goods. Good for you! I really need to get a few things done in the yard while the weather is still good. My husband did rake all the leaves in the front yard Saturday morning, a job that was completely in need of re-doing by Saturday afternoon — LOL. Lots of leaves falling + some wind = a new carpeting of leaves on the front lawn. 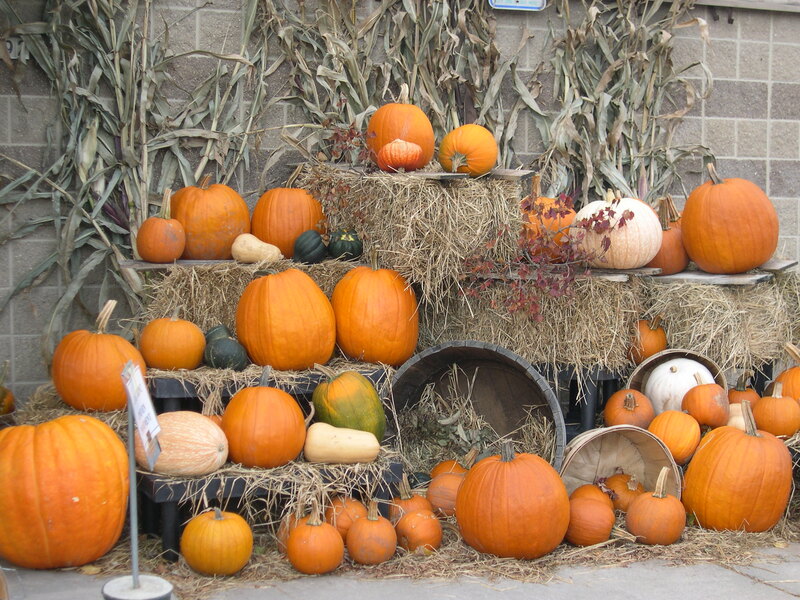 The pumpkin display is wonderful…think I’m going to have to try those cookies as well! I was hoping to do fall yard duties…but it went back up to nearly 100 this weekend…think I’ll wait a bit longer! What cool pumpkin displays!! 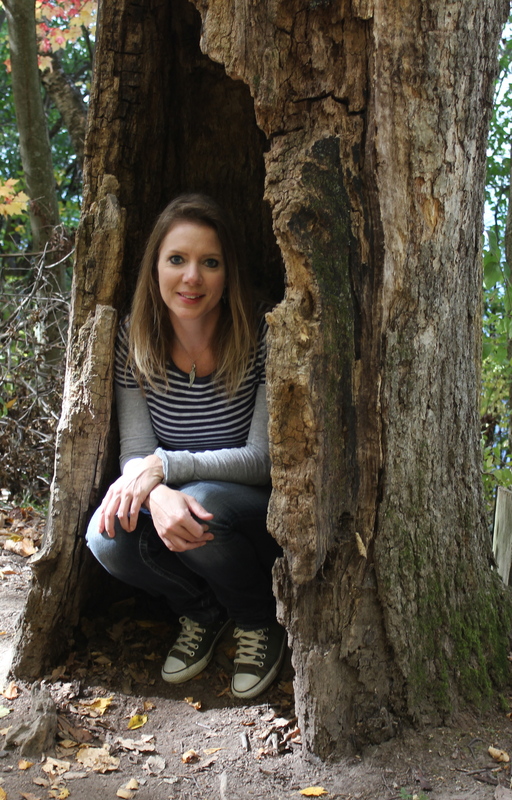 I am like you: I love yard work in the Spring and Summer, but I despise it in the Fall. All those leaves are no fun!! Thanks for sharing the cookie recipe. I am going to bookmark it for future reference! Yipee glad you had a good weekend! Love pumkins. hehe Thanks for sharing your cookies recipe! Have a lovely merry happy week and love to you! Love those pumpkin displays. Funny how we can fool those dear hubbies. I’ve been wanting to make pumpkin cookies with cream cheese frosting, but yours look so yummy too. I may have to try them. Don’t you wish Sundays were 72 hours long? Bet your house smelled amazing when those were baking! I’ve missed stopping by, and you have been so busy! I love your new bags for your shop, and your fall decorations, and your sewing projects. Your halloween bags are just the cutest. I can’t wait to make your cookies, thanks for sharing! 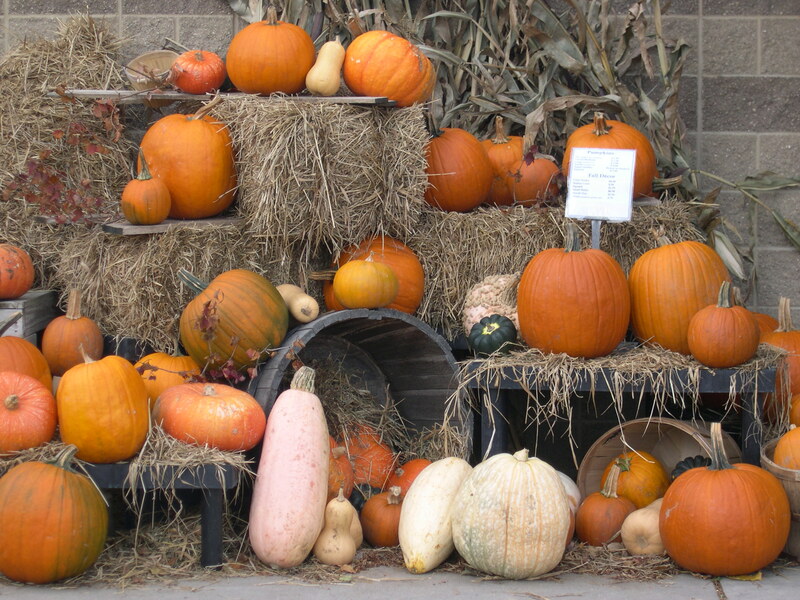 Don’t you just love all of the fall displays! The cookies sound wonderful, I’m going to have to bake some this weekend! Terri — I think you might be missing brown sugar? I just starting measuring out ingredients to make these and noticed I was supposed to cream “sugars”, yet there was only one! I found what looks like the same recipe at http://www.grouprecipes.com/36207/apple-spice-oatmeal-cookies.html and it calls for 3/4 cup brown sugar (hope I have that much!). Thought you might want to make a correction here! I am going to try these cookies!. They sound great!